A staff member at the Cobourg Marina noticed some interesting tracks in the snow and decided to check out the surveillance footage for the evening of Jan. 4, according to the Town of Cobourg. The video shows a snowy owl swooping down to see a young fox. The owl later lands and the fox circles the bird. Finally the fox walks off. Foxes are frequently seen in the area. The snowy owl has been spotted recently by local photographers in the area. Unfazed, the fox continues to walk along the pier when the owl lands on the pier. Over the next couple of minutes, the curious fox paces back and forth, inching closer to the owl, which maintains its position. 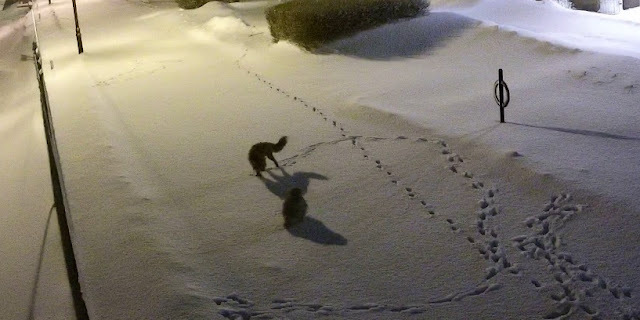 Finally, the fox gives up and runs off. The snowy owl (Bubo scandiacus) is a large, white owl of the typical owl family. Snowy owls are native to Arctic regions in North America and Eurasia. Males are almost all white, while females have more flecks of black plumage. Juvenile snowy owls have black feathers until they turn white. The snowy owl is a ground nester that primarily hunts rodents and waterfowl and opportunistically eats carrion. After being considered of least concern by the IUCN since 1988, the snowy owl was upgraded to a conservation status of vulnerable in 2017. Previous population estimates of about 200,000 individuals are now regarded as substantially overestimated, and a total population size of 28,000 individuals is thought to be more realistic. Responses to "Security cameras capture showdown between snowy owl and red fox"